The Number 10 and Cabinet Office digital team plays an important role in driving and coordinating pan-government announcements and events. 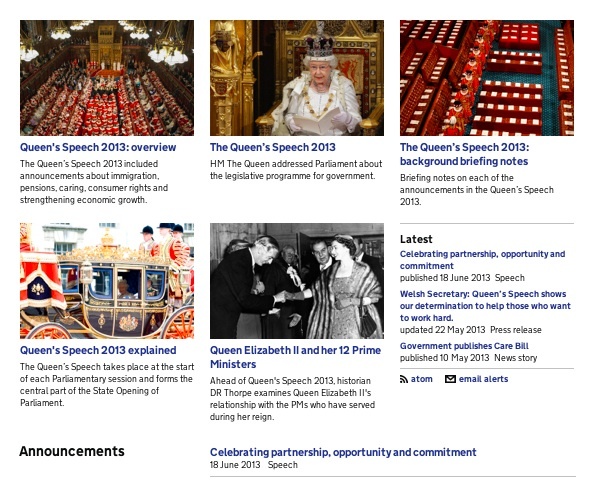 GOV.UK has developed over the past year to help us achieve greater cohesion as part of our broad communications mix. The offices of the Prime Minister and Deputy Prime Minister rapidly followed every government department onto GOV.UK back in April. I wrote about the transition at the time and we’re still making our voyage of discovery into the opportunities and challenges the single domain presents. It already seems like a long time ago, but it’s still only been a few months since content for pan-government announcements stopped appearing on a range of different websites. 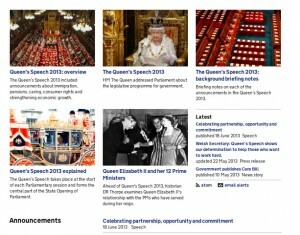 So for example, for the State Opening of Parliament, where the Queen outlines the activity of her government for the following year, content appeared across all affected departmental websites. They can now appear in one place, that can be tagged to all relevant departments. This makes a simpler and less confusing user journey for the user. Of course it still required a large amount of work behind the scenes, to ensure everyone across government is clear about who’s doing what. One of the most significant benefits for me is with the way GOV.UK allows us to inform the user about special one off events. 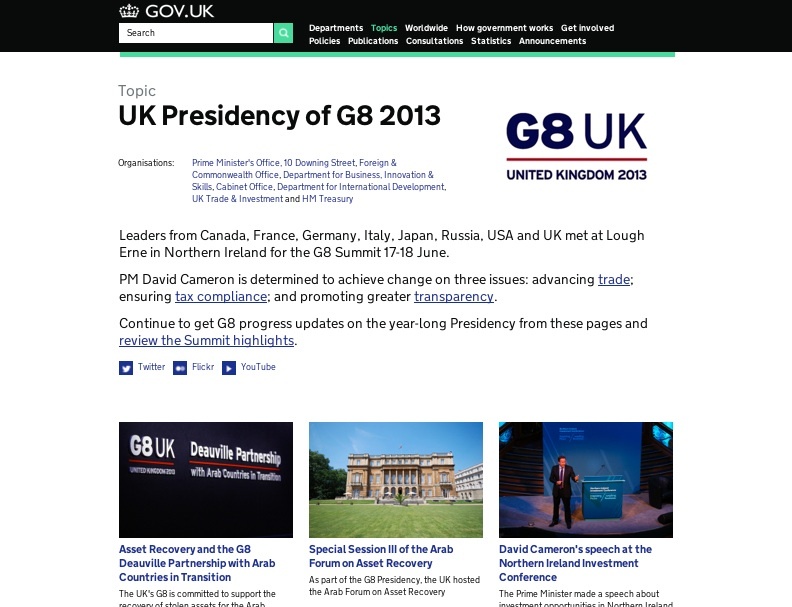 Probably the best example has been the UK presidency of G8, which reached a crescendo at the June summit in Lough Erne, Northern Ireland. In the past this would probably have received its own website, requiring significant resource to build from scratch, under the direction of Cabinet Office. Working with GDS colleagues, the user need to find information for a high-profile event heralded the launch of the ‘Topical Event’ format. Again this easily enables the user to find content without having to worry about which government department to search. Another key ingredient has been to work hard to ensure content is optimised search engines, with the result that if you were to search for G8 in Google our content is one of the top results - so easy for the user to find. When news headlines are dominated by unexpected and impactful events, it’s important that users are able to find out about government reaction, which is often led by the Prime Minister. 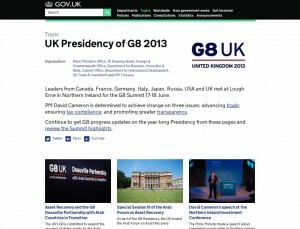 When the tragic events in Woolwich unfolded in May, we were able to react quickly be presenting the PM’s reaction and all other public information in one place - this was highlighted by all relevant departments who could update where necessary, whilst again providing a single place for users to visit. This was also the case in August, after Parliament was recalled following the chemical weapons attack in Syria. One year on since launch, it’s clear to me that the iterative approach of GOV.UK combined with its role as a single domain for all government content has allowed us to think creatively and help meet user need. It doesn’t happen by accident, we still need careful planning and cooperation with colleagues across government. Perhaps the most important lesson for me has been that we can’t sit still - we need to continue to collaborate and innovate and more of the potential of GOV.UK will be realised. Featuring on topics is live: please feature something today!